1. Zayin I (1983) trío 4'01"
2. Zayin II (1989) trío 8'55"
3. Zayin III (1989) trío 6'51"
4. 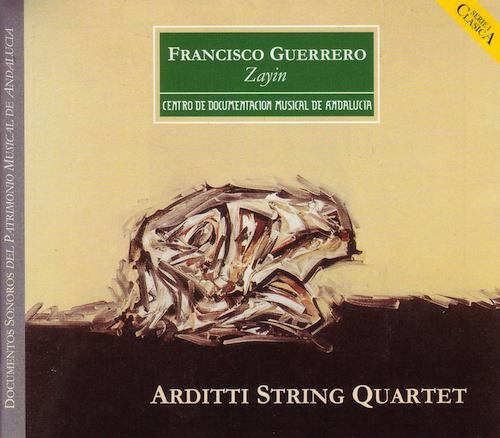 Zayin IV (1994) cuarteto 12'41"
5. Zayin V (1995) trío 9'10"
6. Zayin VI (1995) violín 16'39"
7. Zayin VII (1996) cuarteto 6'31"
8. Paqueño Zayin VII (1997) trío 2'01"
Born in Jaén on the 7th of July 1951, Francisco Guerrero began his musical studies self-taught at the age of six, with the help and advice of his father, who was an excellent teacher. He became a pupil of Juan Alfonso García in Granada and soon showed a precocious talent which led to his receiving the Manuel de Falla Prize in 1970 for his composition Facturas. From his earliest works he shows a particular inclination to investigate the nature of sound to its farthest limits (his interest in electroacoustic technology had begun in the early seventies). But the composers official catalogue starts with Actus (1976), where he first applied methods derived from combinatorial logic. From this time his desire to link the musical and scientific dimensions becomes stronger and stronger. His music has been critically acclaimed on the international scene and his works are programmed in the most important music festivals and played by the most prestigious performers. From the mid-eighties Guerrero incorporated in his music methods derived from fractals, a new type of geometry that procures mathematical models to structures dominated essentially by chaos. Based on the principie of similarity, fractals offer the composer a new structural focus, in which everything is reflected in the part and vice-versa, allowing a new and more global view of the musical discourse. Two lines converge in Guerrero’s music, obvious on first listening: a supreme demand for objectification, together with the exacerbated laying open of his own self. The features of his personality can be easily recognised in his work: a radical spirit and a fierce and proud temperament, inseparable elements of his Andalusian nature. The use of mathematical processes was never a cerebral exercise. In fact the opposite would seem to be the case. His sound structures are bursting with imagination, capable to liberate such expressivity that the impact on the listener is immediate. Over the years Guerrero has been able to deal with all genres, instrumental, vocal, orchestral and chamber music. Zayin represents without a doubt one of the high points in his catalogue, both for its exquisite musical value and for its ambition and reach. Zayin is a cycle of seven pieces that revolvesaround the number seven (in Hebrew zayin is precisely that number): seven chamber pieces, whose length adds up to seventy minutes. The referente to the number seven concerns not only the global relationship between the different pieces, but also the proportion between them. The original idea of writing seven string trios turned with time into a more varied group of works: Zayin IV and Zayin VII are written for quartet, Zayin VI for solo violin. Finally, the total duration of the cycle would be 61 minutes (6+1= 7). The long composition process, from 1983 to 1997, means that the work has registered the key moments of the composers stylistic evolution. The first piece is written using the processes of combinatorial analysis, while the rest are written using other techniques.